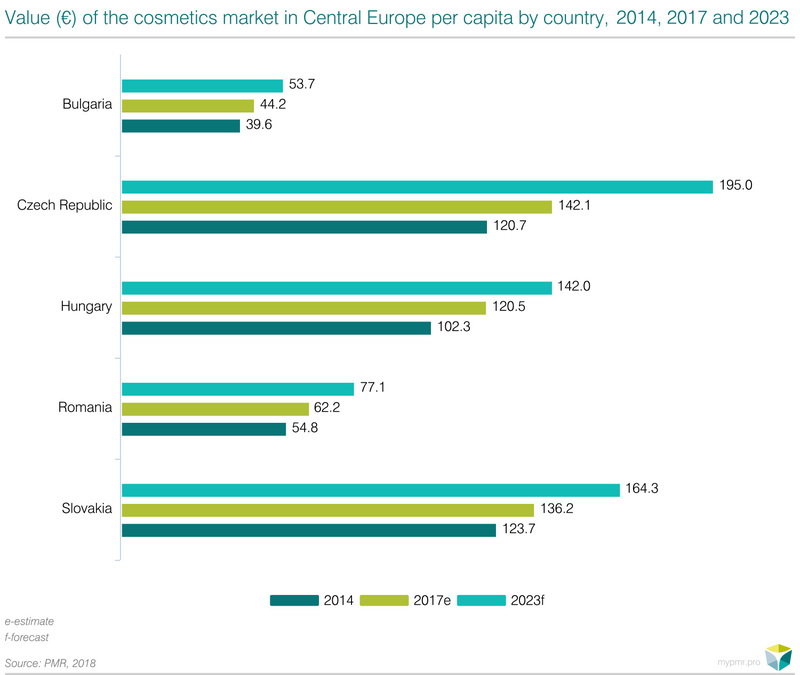 The cosmetics retail market in the five CE countries (i.e. Bulgaria, the Czech Republic, Hungary, Romania, Slovakia) grew by 5.5% in 2017, while its value reached €5bn. These are the key findings from a new report by PMR, “Cosmetics retail market in Central Europe 2018. Market analysis and development forecasts for 2018-2023”. In all of the countries under review, market values increased in 2017, which bodes well for the future. The highest growth was noted in Hungary and Romania, while the lowest increase occurred in Bulgaria. Improving macroeconomic conditions should support consumer spending on cosmetics in all the analysed countries in the years ahead. Among the non-economic factors driving sales of cosmetics are the expansion of cosmetics chains, the growing popularity of online sales, the increasing purchasing power, and growing consumer awareness. In per capita terms, Czech consumers spent €142 per head on cosmetics in 2017, the most in CE. The Czech market is the most mature and the most developed in the region. Bulgaria is on the other end of the scale in terms of per capita sales, consumers there spend €44.2 on cosmetics per annum. Cosmetics stores have the highest market share in the Czech Republic as well, with 45.3% of retail cosmetics sales happening there. Romania is at the other end of the scale, with cosmetics stores accounting for 30.6% of the market. The clear leader of the cosmetics market in the CE, dm drogerie markt, has nearly 17.1% market share. The large international player dominates four markets in the region in terms of sales revenues, namely Bulgaria, Czech Republic, Hungary, and Slovakia. However, it is quite likely that the retailer will also overtake the current leader of the Romanian market in the coming years. That leader now is Avon, a direct sales company, which has 7.6% of the market share in Romania. Apart from Romania, Avon is among the top 10 retailers in all CE countries. It is third on the Bulgarian market while in Hungary, the Czech Republic, and Slovakia, the retailer is fourth. Most of the largest companies in the CE markets are of foreign origin. Only in two countries, the Czech Republic and Slovakia, are domestic players present among the top three retailers, specifically the 101 drogerie chain in Slovakia and Teta/Top Drogerie, operated by p.k. Solvent.